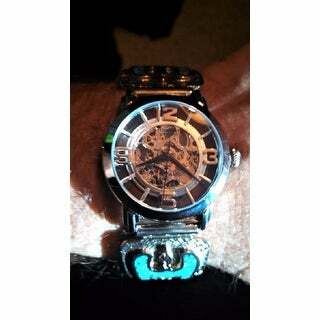 I love this watch its very classy looking and keeps great time. It is a bit thicker in size then I prefer but thats just because of the work I do and it gets hung up on things. I am very glad I bought it. For the first time, Stuhrling Original takes a prominent member of the Winchester Family and makes it accessible to ladies who want a fully skeletonized automatic timepiece. 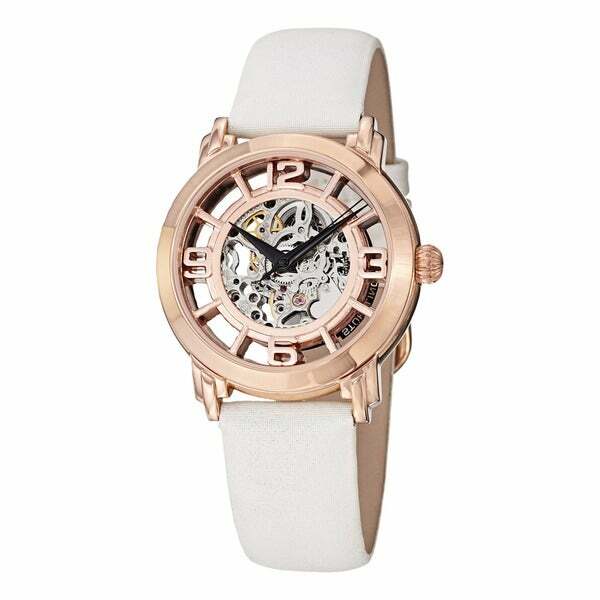 Within the petite stainless steel case is a floating movement set in place with spoke-style numerals. The Lady Winchester makes use of the ST-906DSK movement, one of the newest additions to Stuhrling's line of automatic movements whose most prominent feature is the miniaturized rotor. This stunning timepiece comes equipped with a genuine leather strap with satin twill cover that matches the color of the hands. Very nice watch. Looks Great. The watch arrived very fast. Only 3 days. It really looks great and seems to keep good time. I changed the band to a sterling silver with turquoise and corral inlay flex band, which is 18mm and is why I purchased this watch even tho I am a dude. I have had the band since I was 18. Now 54. I received my watch within 2 days of placing my order. It was packaged beautifully and it looks great. I have not worn it yet, however I feel this will not be my last stuhrling watch. Everyone who sees it loves it. Love the size. Very well built... my 3rd stuhrling watch. Beautiful Watch... I gave it as a gift to my wife.. She loves it and get many compliments about it..
love the watch it's great to wear to work or play. Love the watch! The band doesn't form to my wrist as well as I would like but it looks great on. Love the looks of the watch. It stopped working a few days ago.